A volcano is an opening in the Earth’s crust where magma – a mixture of red-hot liquid rock, mineral crystals, rock fragments and dissolved gases from inside the planet erupts onto the surface. Volcanic eruptions produce a wide range of landforms. These landforms are affected by the type of lava, the materials produced and how the eruption takes place. The behaviour of lava is affected by its viscosity (consistency e.g. thick, sticky, semi-fluid), which is determined by its chemical composition and temperature. Volcanoes can be classified according to the type of eruption. Explosive eruptions involve magma being violently fragmented when expelled from a volcano. Composite volcanoes, sometimes known as stratovolcanoes, are steep-sided cones formed from layers of ash and acidic lava flows. 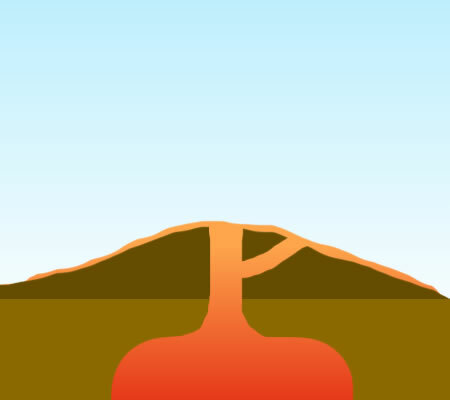 Most composite volcanoes contain complex internal networks of lava flows which contain intrusive (below ground) igneous features such as sills and dykes. The eruptions from these volcanoes may be a pyroclastic flow rather than a flow of lava. A pyroclastic flow is a superheated mixture of hot steam, ash, rock and dust. A pyroclastic flow can travel down the side of a volcano at very high speeds with temperatures over 400 degrees Celsius. Composite volcanoes can rise over 8000 feet. When composite volcanoes erupt they are explosive and pose a threat to nearby life and property. Eruptions are explosive due to the thick, highly viscous lava that is produced by composite cone volcanoes. This viscous lava has a lot to do with why they are shaped the way they are. 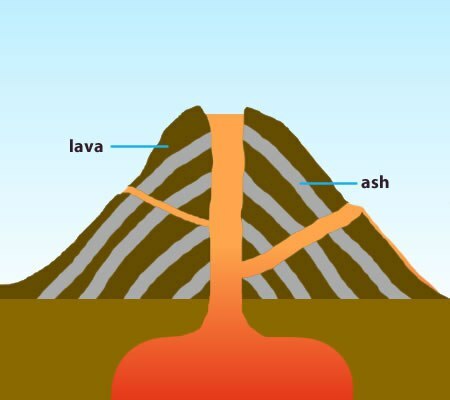 The thick lava cannot travel far down the slope of the volcano before it cools. Composite volcanoes are usually found at destructive plate margins. 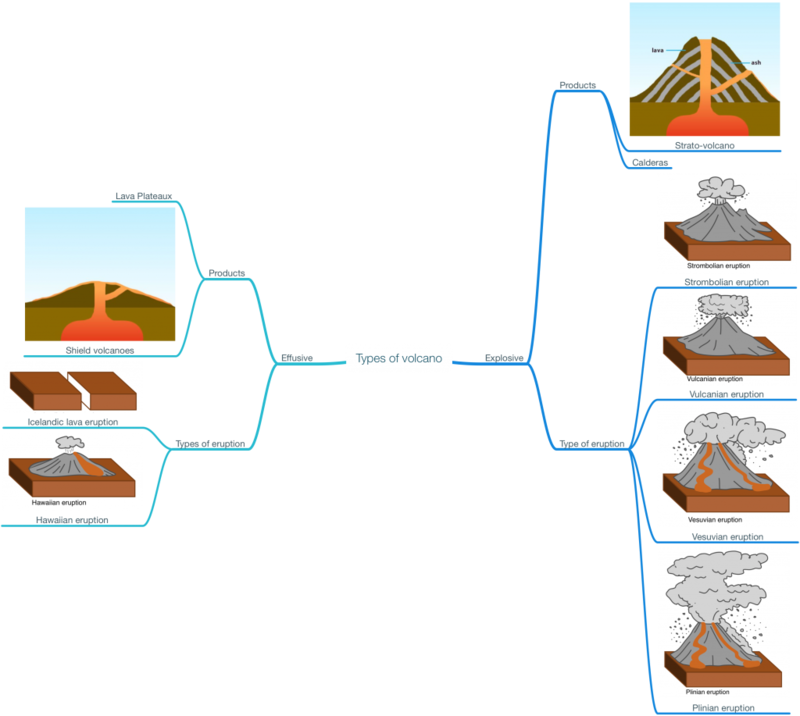 Examples of composite volcanoes include Mount Fuji (Japan), Mount St Helens (USA) and Mount Pinatubo (Philippines). Convergent plate boundaries and explosive eruptions give rise to chains of strato-volcanoes. There are 66 strato-volcanoes in the Andes that have recently erupted. A caldera is a volcanic crater, usually more than 2km in diameter. They form when an explosive eruption destroys the cone and the magma chamber below is emptied. Without magma providing support below a caldera is formed when the sides of the volcano collapse. An effusive eruption is a type of volcanic eruption in which lava steadily flows out of a volcano onto the ground. When basic lava flows from many fissures large areas can be covered by free-flowing lava known as flood basalts. One example is the Deccan Plateau in central India. When they are formed they have a slope of 1°. Over time denudation creates a more varied relief. Shield volcanoes are low with gently sloping sides and are formed from layers of lava. 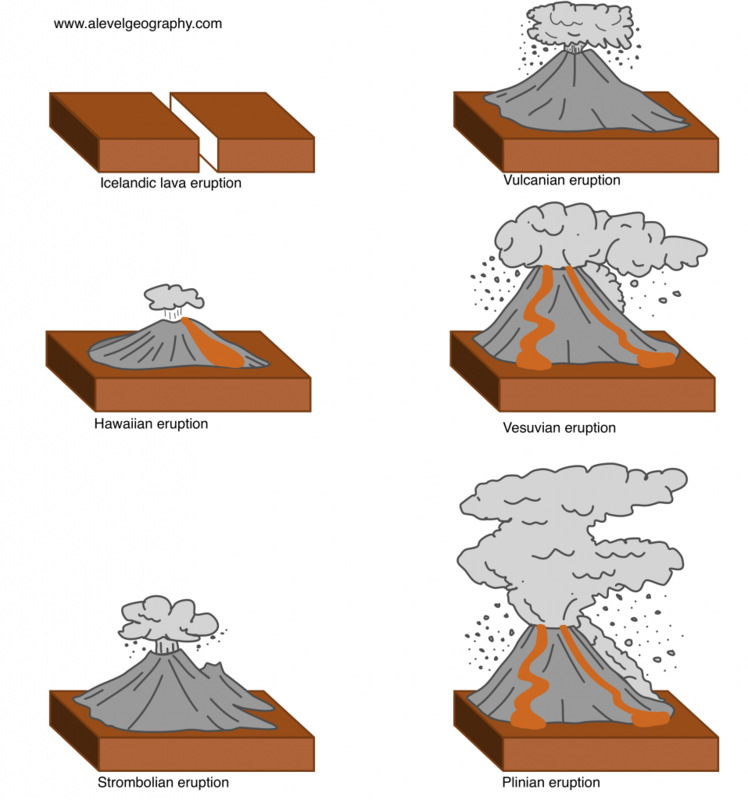 Eruptions are typically non-explosive. Shield volcanoes produce fast flowing basic (fluid) lava that can flow for many miles. Eruptions tend to be frequent but relatively gentle. Although these eruptions destroy property, death or injury to humans rarely occurs. Shield volcanoes are usually found at divergent (constructive) boundaries and sometimes at volcanic hotspots. Examples of shield volcanoes include Mount Kilauea and Maunaloa on Hawaii. Iceland owes its existence to effusive eruptions at a divergent margin between the North American and Eurasian plates. The chain of islands that form Hawaii lie at the centre of the Pacific Ocean, thousands of miles away from a plate margin. Hawaii was formed due to a volcanic hot spot. This is a fixed area of volcanic activity where magma rises from a mantle plume. As the Pacific Plate moves north-west over the plume huge amounts of basalt have accumulated on the ocean floor to produce the Hawaiian islands. As the plate moves away from the hot spot active volcanoes lose their source of magma and become extinct. Not all volcanoes that form at hot spots are shield volcanoes. El Tiede on Tenerife is a strato-volcano. Volcanoes are found in three states – extinct, dormant and active. An extinct volcano will never erupt again. A dormant volcano has not erupted in 10000 years. An active volcano has erupted recently and is likely to erupt again. Mount Kilauea, Hawaii, is an example of an active volcano. Are all volcanic eruptions the same? The simple answer is no! Volcanic eruptions are often thought of as cataclysmic explosions that produce vast quantities of lava, ash and other volcanic materials. However, volcanoes can actually erupt in a range of different ways. A volcano can erupt in a range of different ways during different eruptions and even during different stages in the same eruption. Icelandic eruptions are characterised by a persistent eruption along a fissure. Large volumes of basaltic lava form large horizontal plains or plateaux. The Deccan Plateaux is an example. In Hawaiian eruptions, the lava is more basic and basaltic, with low gas pressures and low silica content. This means the lava is very runny. These eruptions are generally not explosive or destructive and do not throw huge amounts of Tephra or pyroclastic material in the air. Instead, they produce low-viscosity, low-gas-content lava that flows over large areas producing gently sloping shield volcanoes and lava plateaus. Eruptions can form fire fountains, Lava thrust up to 50m in the air for many hours. The general eruption style is a steady lava flow from a central vent, which can produce wide lava lakes, ponds of lava forming in craters or other depressions. Strombolian eruptions are named after Stromboli in Italy. The effects are impressive but not particularly dangerous. They eject short bursts of lava 15 to 90 meters in the air. The lava has a fairly high viscosity (it’s quite thick due to its high silica content), so gas pressure builds up before the material can be ejected from the volcano. These regular explosions can produce impressive booming sounds, however, the eruptions are relatively small. Lava flows from Strombolian eruptions are not common though they do produce small amounts of ash. 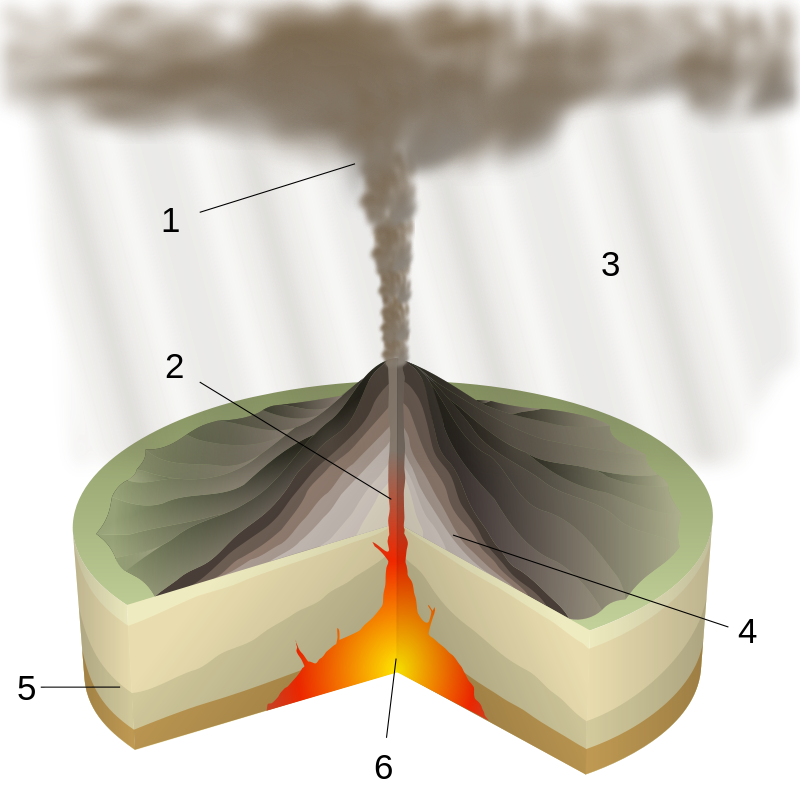 Vulcanian eruptions involve violent gas explosions that blow out sticky plugs of lava. These fragments build up cones of ash and pumice. Lava is very viscous and solidifies rapidly. The eruption usually clears a blocked vent and releases a significant amount of ash. Named after Mount Vesuvius, vesuvian eruptions involve very large blasts of gas that force large ash clouds into the sky. They are more violent than Vulcanian eruptions. Ash falls on the surrounding area and lava flows can also happen. These the most explosive and violent of volcanic eruptions. They produce huge plumes of ash and gas that typically takes the shape of a huge mushroom cloud. Plinian eruptions are also known as Vesuvian eruptions due to their similarity to the eruption of Mount Vesuvius in 79BC. In Plinian Eruptions the magma has high silica content. They are highly explosive and the AD79 eruption that buried Pompeii and Herculaneum was one of these. Plinian eruptions are started by highly viscous magma that has high gas content. As the magma emerges it depressurizes and this allows the gas to expand, propelling pyroclastic material as high as 45 km in the air, at hundreds of feet per second, up and out of the Troposphere. These eruptions can last for days and create a sustained and tall http://www.buyambienmed.com eruption plume, which drops a huge amount of tephra, fallen volcanic material, on surrounding areas. Additionally, a Plinian eruption can produce extremely fast-moving lava flows that destroy everything in their path.